Astronauts on the International Space Station wish Earth a Happy New Year for 2014 in a video message shown in New York City's Times Square during the New Year's Eve bash on Dec. 31, 2013. From left, they are: Rick Mastracchio and Mike Hopkins, both of NASA, and Koichi Wakata of Japan. The people of Earth rang in 2014 with raucous celebrations that reached all the way to space, where astronauts on the International Space Station helped usher in the New Year. Three space station astronauts recorded a video wishing humanity a Happy New Year that was broadcast in Times Square during New York City's epic New Year's Eve bash. 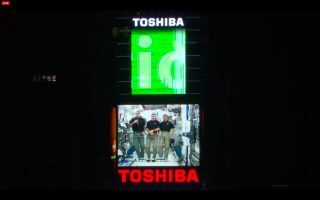 The video was introduced by NASA astronaut Mike Massimino from Times Square and featured on the iconic Toshiba Vision screen. In the video, NASA astronauts Rick Mastracchio and Mike Hopkins, joined by Japanese astronaut Koichi Wakata, wish people on Earth a happy new year before floating up out of view. The trio makes up half of the space station's Expedition 38 crew, with three Russian cosmonauts rounding out the team. NASA astronaut Karen Nyberg, who returned from the International Space Station in November, also shared well wishes for New Yorkers and the world in 2014. "As seen form 260 miles above its surface, our earth is a beautiful, fragile place. We are living and working on the International Space Station to learn about our Earth, and to learn how to send humans farther into our solar system than we've even been before," Nyberg said. "From all of us at NASA, in space and on Earth, Happy New Year." Space exploration is also making an appearance in today's 125th Tournament of Roses Parade in Pasadena, Calif.
NASA's space shuttle Endeavour is featured in a float by the City of Los Angeles, with other floats depicting the Apollo 11 moon landing, an alien spaceship and an intergalactic family vacation.